This article was originally posted on Shambhala.com. The Passover prayer book, or Haggadah, that my family used when I was growing was in English, Hebrew, and transliteration of the Hebrew. The story told is that when I was nine years old, I cut out strips of white paper and taped them over the English and transliteration, wanting only to read the original Hebrew language. A sure sign of a budding zealot or rabbi. While I did become a rabbi, and not a zealot, what I didn’t appreciate then was that the stories in the Haggadah were only one half of the action on Passover. It would take me many more years to learn that eating the special foods of Passover can be an embodied spiritual practice in itself that helps us internalize the main point of the holiday. IT WOULD TAKE ME MANY MORE YEARS TO LEARN THAT EATING THE SPECIAL FOODS OF PASSOVER CAN BE AN EMBODIED SPIRITUAL PRACTICE IN ITSELF THAT HELPS US INTERNALIZE THE MAIN POINT OF THE HOLIDAY. Passover is the Jewish holiday that testifies to the ongoing belief in and determination to achieve this redemption. The central ritual of Passover, the festive meal called the Seder, serves as the main vehicle for reaffirming this belief. PASSOVER IS THE JEWISH HOLIDAY THAT TESTIFIES TO THE ONGOING BELIEF IN AND DETERMINATION TO ACHIEVE THIS REDEMPTION. The rabbis of old, who developed the annual Passover night rituals contained in the Haggadah, set for themselves a very high educational bar. The Haggadah itself throws down the gauntlet, saying, “In every generation, one is obliged to regard themselves as though they themselves had actually gone out from Egypt. . . .” The experience of oppression and freedom needs to be personal if Passover is going to serve its function of reminding us to stay at the work of liberation and redemption. At different times over 3,000 years of Jewish history—including the Crusades, immigration, the Holocaust, and return to the Land of Israel—not much creativity was needed to feel oppression and the yearning for freedom. But in times of relative tranquility we need the rituals of Passover to generate this first-hand experience to keep us from drifting into complacency in our comfort and forgetting our covenantal role in nudging the world toward universal redemption. How to get people to relate personally to the message? Tell stories and literally digest the message! The Haggadah is not an expository essay or history of the Exodus from Egypt. Rather, it is a series of stories about the experience of slavery and the miracle of freedom. We are all encouraged to be storytellers this night and share our own freedom experiences or those we’ve heard about. When I can locate myself and my aspirations in the real stories of others, I now have a place and know this whole freedom business is about me too. I’m invested in keeping the story going. The other way to personalize the message is to embody the experience of oppression and freedom through food. 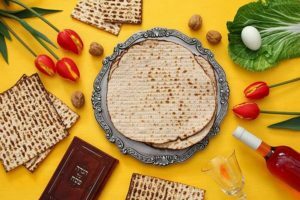 The ritual eating of Matzah (unleavened bread) and Maror (bitter herbs) communicate the holiday’s central message by literally putting it into our body. I want to share two ways of doing these rituals that have been meaningful to me over the years. If you follow these instructions, I guarantee you will experience these rituals differently. Matzah is any wheat (or barley, spelt, rye, and oat) flour that is mixed with water and cooked before 18 minutes pass, which is the time that the dough begins to rise. In some cultures the Matzah looks like a large cracker, and in others it is softer, like a tortilla. In my family we like using the hand-baked, large round Matzahs with ample burned parts to give us that old-time taste that is hard to get with the nice, square, uniform-shaped, machine baked versions. Eating matzah on the first night of Passover is actually the only form of eating instructed by the Torah that we still have today. All the other things our ancient scriptures tell us to eat are related to sacrifices that fell by the wayside of history. In an ironic way, Matzah, this poor person’s bread, represents freedom. It is the bread the Israelites ate as they left hundreds of years of slavery behind. Each person at the table takes a piece of matzah. After the blessings are said, everyone remains silent for the next few minutes while the Matzah is consumed. Savor your Matzah. Look at its contours. Feel it with your fingers. Smell it. Slowly chew it and let yourself taste the flour. Eat it slowly and imagine the Israelites quickly leaving the only home they ever knew, refugees on the run from an oppressive master going into the unknown, but as free people. Chew some more matzah and hear the sound of others chewing. At an agreed upon time the leader calls everyone’s attention back for the next ritual. The bitter herbs are the other major ritual food item for embodied practice. Many people use horseradish because of its sharp bite. In an instructive twist in Jewish law, the bitter herbs must be chewed before swallowed, whereas one technically fulfills the obligation of eating matzah even if swallowed whole without chewing. We need to taste the bitter herbs to embody how life is embittered by oppression. WE NEED TO TASTE THE BITTER HERBS TO EMBODY HOW LIFE IS EMBITTERED BY OPPRESSION. Each person takes a portion of bitter herb on their own plate. After the blessing, everyone remains silent again as the bitter herbs are consumed. Slowly chew the horseradish, or other bitter herbs, letting the burning juices sink into your tongue and open the sinuses. (Warning: Too much bitter herb can actually hurt so take only as much as you think you can handle. The point is to feel the burn, not to hurt yourself). As you are chewing and feeling the sting, consider the following. The Mussar teachers explain that the Yetzer Harah’s (the Inner Adversary) main strategy is to keep us busy, moving so fast that we don’t absorb our own reality or the reality of the world around us. There is so much suffering in the world. Our own suffering and the suffering of others—migrant workers who harvest our food being paid less than a living wage who expose themselves to dangerous pesticides and contract illnesses and do not have the health insurance needed to heal. Subsistence farmers in Central and South America forced by economic need to produce only one type of crop, no longer having the ability to feed their own families. Or closer to home, a relative may be silently suffering health problems, family strife, or economic vulnerability. The bitter herbs practice is teaching us that we can’t be numb to suffering if it is to have its cathartic and motivating impact. Our busyness urges us not to look, not to dwell, not to really feel—even our own suffering. However, it is the bitter taste that reminds us that this is not ultimately the way the world should be. It is possible to end suffering and we are key players in the process. May this Passover help us know, in a fully embodied way, that we can create change. The conditions of our lives are not permanent or inevitable. Our human inheritance is to be free and create relationships and communities that honor dignity of all creation. FOR THE TORAH SAYS: “YOU SHALL TELL YOUR SON ON THAT DAY, SAYING: ‘FOR THE SAKE OF THIS, HASHEM DID FOR ME WHEN I WENT OUT FROM EGYPT.’” NOT ONLY OUR FATHER DID THE HOLY ONE, REDEEM, BUT ALSO REDEEMED US WITH THEM . . .
To see the original article, visit Shambhala.com.